I’ve been having conversations recently about favourite old time things: movies, television series, games – childhood really – and one thing leads to another. It’s the “remember x?” conversation. Which led me to thinking about all the things we used to do in our childhood that kids no longer do; they’re either no longer acceptable or kids aren’t interested in them in this new technology-driven digital era. – playing with cap guns and air rifles. and then there was a game we played (solo) with a tennis ball in the end of a stocking against a brick wall (go figure!) to the rhyme of: “hello, hello, hello sir, take me to the show sir, yes sir, no sir….” and a similar game called “Oliver Twist” (see below). 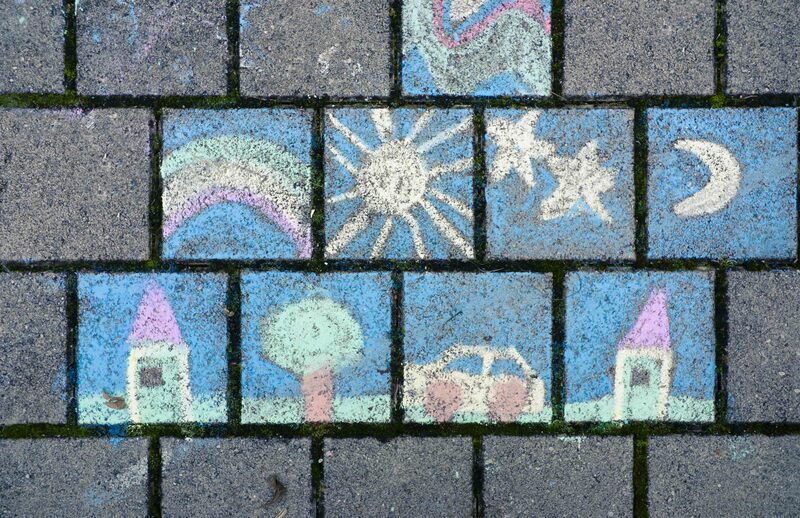 As kids my sister and I spent many hours covering the outside of our brick house with chalk, gradually extending around all 3 sides (the front was off-limits!) and up as far as we could reach, either playing ‘school’ or just drawing. Our dad painted the corridor of the back part of the house with washable paint so we could also draw on that – kept us endlessly amused and occupied during the unheated cold winter. In summertime we used to get up early and lie on the couch reading books and then drag blankets and cushions outside to lie in the sun reading and looking up at the sky and making pictures out of the clouds. Nothing to do. We played underneath trees and set up shop, bringing out tins of things from the kitchen and making our own pretend money. Mum had a set of old fashioned scales with little brass weights which we often brought out so that we could weigh things. Growing up in Melbourne where we caught trams a lot (mum didn’t drive and so we walked everywhere or caught the tram); one of our favourite past-times was playing “trams” whereby one of us would be the conductor (my grandmother had a belt hole-puncher which was a perfect substitute for the ticket puncher tram conductors used) and the other one would hang on to the clothes line (a ‘hills hoist’, that iconic Australian backyard staple) as though hanging on to an overhead hand strap. We would simply walk around in circles. Sounds pathetic, but it took very little to live in our imagination. There was a colonnade of plane trees in the grounds of our Primary school and in the autumn as the leaves would fall we would sweep them up to configure them into ‘houses’ – floor plans – with the aim of playing ‘families’. But the real joy was just in the physicality of creating the shapes. 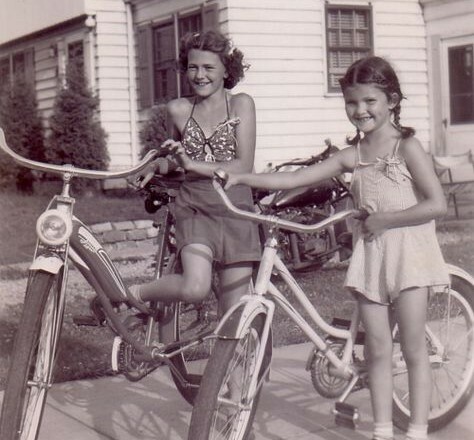 We were always on the go, playing games, sport, creating things. And when we weren’t on the go we were making things: dolls’ clothes, paper doll outfits, sewing, baking (our poor mothers!) or reading – lost in the realms of fantasy and fiction. I don’t think we were ever bored. 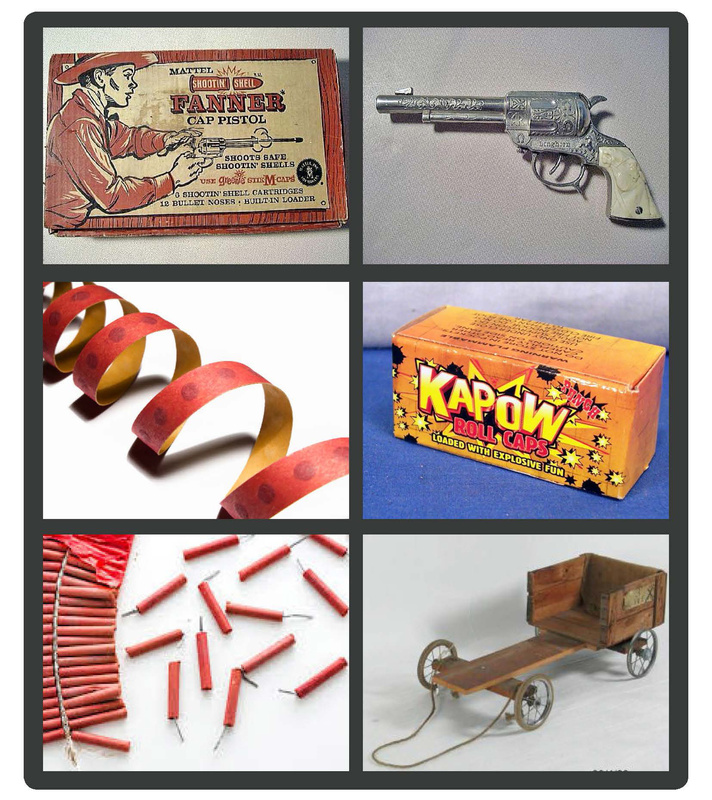 Posted on September 23, 2015 Categories behaviour, childhood, games, UncategorizedTags cap guns, Childhood, elastics, games, hoola hoops, hopscotch, skipping ropeLeave a comment on Remember when?